Theses are ALL the U.S hucards spine sticker labels for the TG16 game cases including the 21 that did not come with jewel cases. These match up close to the original TG16 spine labels in fonts, quality & colour codes. They are professionally printed and the colours are rich with a very deep black & a nice finish. ALSO now have labels the entire TG CD/Duo line up as a spine sticker option. 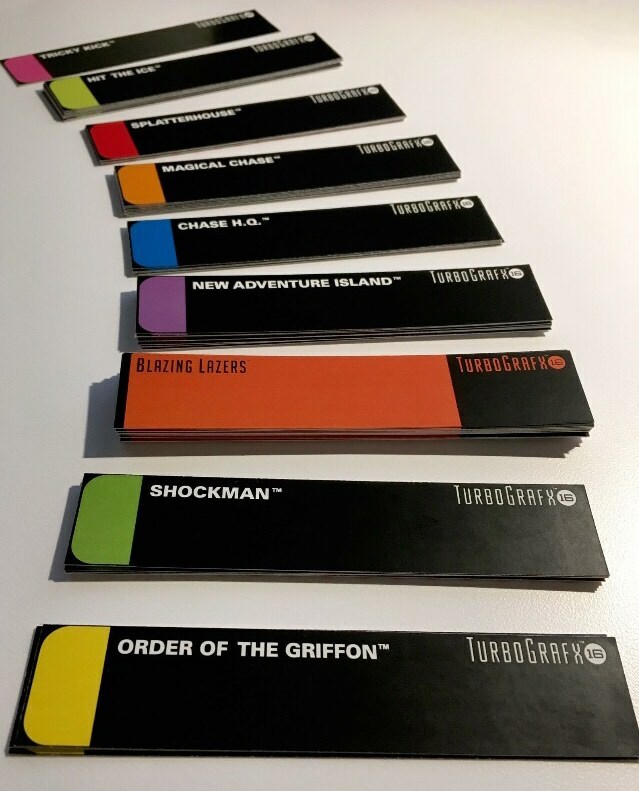 Sticky-Small… This set includes all 21 spine label stickers for the TG16 US Hucard games that did not come with jewel cases and were never produced. Pict of Large set below..
Pict of Small set with holder.. see below..
Last edited by Sparky on Sat Aug 20, 2011 12:58 pm, edited 26 times in total. This is a much more elegant solution than what I did. I took measurements of the end label and did up a CD insert in photoshop. On a cursory glance it looks at least passable. 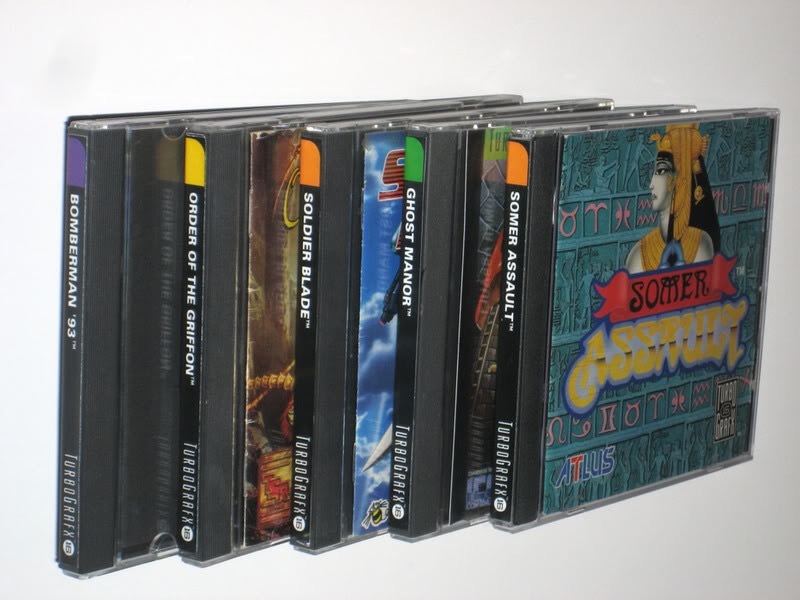 Are the end colors authentic to their respective games, minus the ones that didn't have spine labels anyhow? I imagine we'd have to buy the whole set eh? I'm interested, depending on the cost. Shouldn't be TOO expensive though, if you're getting 16 labels on a sheet, that should come out around 6-7 sheets. 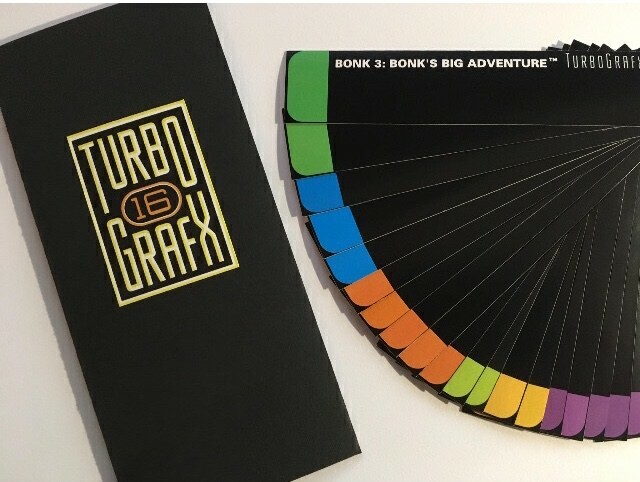 yes the end colours will be the same as the official TG16 ones, and the ones that never had cases the labels will follow the colour scheme as the other games exp. shooters =orange, sports =green, etc. But Yes Charlesaway you can get a whole set on 6-7 sheets but i have not decided on how im selling these, set, sheet, individual but if i was to sell the set and if people would cut these out themselves (they will have crop marks) there would be cost savings. so, uh... where you getting these printed? I'd suggest individual sales, honestly. im getting them printed at a place called Paragon… been using them for years for small jobs like this. Should i be using someone else? You could make some labels for April Fools day as well, Super Mario Bros, Sonic the Hedgehog, Quake, etc. All you need is instruction manuals to match, and you're ready to post some "newly discovered prototypes". Wow! Great job and very good idea. Please let me know when you have final pricing for those. So anymore interest please let me know. Thanks again. Any news on this? My Magical Chase is begging for a spine sticker.